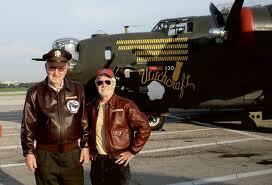 Lee Lamar and Dennis Okerstrom traveling to and from Croatia to recover Lamar's World War II airplane. Lee Lamar, a World War II pilot who was stationed in Italy, received a mysterious email message in 2004. "If you left a bomber in Croatia in World War II, I have the pieces if you want to come and get them." In his home in Overland Parks, Kansas, Lamar blinked his eyes several times, raised his eyebrows to his hairline, and read the email again. An archeologist, Luka Bekic, doing a dig in Croatia, had uncovered the remains of Bottoms Up, Lamar's B-24 bomber that was shot down on its last mission November 18, 1944. Lamar and his crew had been hit by a German anti-aircraft shell. Lamar abandoned the plane by parachute and was taken prisoner of war along with three of his crewmates when they hit ground. Lamar always wondered what happened to his plane. Bekic had found the answer. In 2007, Lamar, Lamar's family, Dennis Okerstrom, an English professor at a Missouri college, and members of Okerstrom's class traveled to Croatia to claim the shards, meet the people who helped eight members of Lamar's crew escape, and gain closure to a sixty-year-old puzzle. Okerstrom had learned of Lamar's story and eventualy wrote a book--The Final Mission of Bottoms Up: A World War II Pilot's Story--about Lamar's adventures as a pilot and his return visit to Croatia. I enjoyed hearing Lamar and Okerstrom tell their stories recently at the Eisenhower Visitors' Center in Abilene, Kansas. Learning about his abandoned bomber was quite a surpise to Lamar. Bekic was walking around, simply paying attention when he unearthed a great treasure. Made me wonder what leftovers might be found by walking around and paying attention. Your own or someone else's? For instance, if I returned to my childhood hometown, I might find myself treading over mini-scraps of rubber, left from a bicycle tire that a friend and I blew up. We had loaded the flat-tired two-wheeler into the back of my dad's old pickup truck, driven to the service station, and were standing on the pickup bed, filling the tire with air. We either got carried away and put too much air in the tire or the tire tube was weak, or both. Whatever the case, the tire blew up in our faces and scattered rubber bits all over the pickup and the street around us. Or if I returned to the backyard of my childhood home, I might walk on dissolved mud pies, each with its perfectly imbedded dandelion blossom. Pretty little things at one time; returned to the earth by now. We had a big stone fireplace in the backyard where I baked my mud pies. What a thrill to put the soft, squishy delicacies on the fireplace rack and come back later on a hot afternoon to find them baked to perfection. I filled the newly created dishes with strawberries and faked a birthday party. Or if I traveled to Tijuana, Mexiso, I might walk over a favorite necklace loaned to a friend who lost it there. That would be as unlikely as Lamar's B-24 bomber being found, which happened. Then, there's a more recent sad story that had a happy ending. I dropped a precious ring down the drain of a large laundry tub. Clink, clank, and it was gone. I gasped loudly and did a panic dance. Then I remembered that a plumber had shown me how to undo the drainpipes when they were clogged. Seemed like the same procedure could rescue the ring, so I unscrewed the connections, sopped up the water dribbles, and retrieved the ring before it traveled any further toward disaster. The story of the recovery of Bottoms Up, an airplane shot down over Croatia November 18, 1944. Is it a comfort to know that nothing new is created, and likewise, nothing is destroyed as Greek philosophers told us? What used to be may, after all, be recovered. Thanks to Lee Lamar and Dennis Okerstrom for sharing their stories and being reminders that what goes down may be transformed to come around again and again.